✓ Detects if and when your fragile or valuable items are mishandled! when with a visible, flashing alarm! ✓ Provides a compelling deterrent to negligence! Protection and detection in one square inch! 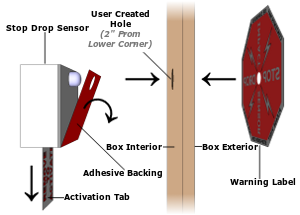 ✓ Stop Drop is a small, package-mounted, disposable, electronic impact sensor. an informed decision before accepting a potentially damaged package. ✓ Stop Drop's tamper resistant design holds shipping companies accountable. 1. Remove Stop Drop from its packaging and keep the included warning label (pictured at right). 2. Pierce a small hole through any side of your outer shipping box, approximately 2 inches from a lower corner for best results, with a round, sharp object (e.g., pen, pencil, screwdriver, etc.). 3. Remove adhesive backing from Stop Drop, align indicator LED with hole, and firmly affix to inside of shipping container. 4. Remove adhesive backing from the warning label, align indicator LED with hole, and affix to outside of shipping container. 5. Pull to completely remove the activation tab. 6. Purchase shipping insurance commensurate with the content's value, then ship your package with peace of mind, and notify the recipient that Stop Drop will detect if and when mishandling occurs! 1. If Stop Drop's indicator LED is not flashing, your package was handled with care. Open and enjoy! 2. If Stop Drop's indicator LED is flashing, your package suffered a significant impact and its contents may have been damaged. Impact time is conveyed to determine who is responsible for any negligence. 3. To determine when the impact occurred, count the number of Blue, Green and Red flashes, enter each in the corresponding box, provide the tracking number or appropriate time zone, and click submit. 4. Check the possession indicator or compare the reported time with your tracking information to determine if mishandling occurred while your package was in the shipping company's possession. 5. If damage occurred while in the shipping company's care, file an insurance claim, and reference the Stop Drop provided time of significant impact as evidence of their mishandling of you package.